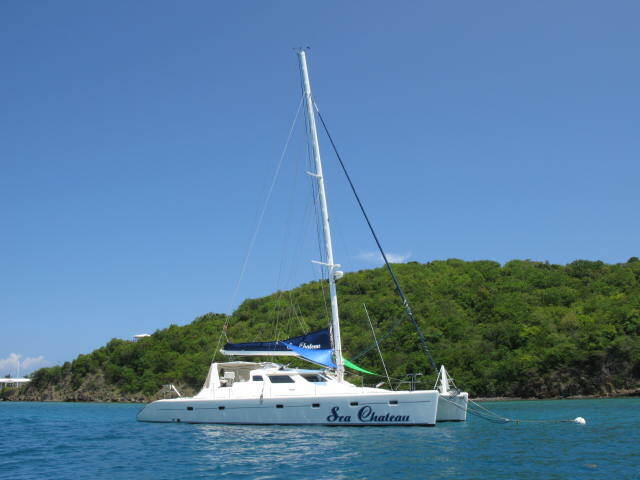 Book now to take advantage of these great savings on catamaran Sea Chateau! Sea Chateau is a Voyage 50 Mayotte Catamaran. It was especially designed by famed Naval Architect Alexander Simonis for fast, comfortable, luxury charters. Its extra wide beam offers outstanding stability, safety and exceptional space in its four staterooms with queen beds and en suite heads, huge saloon, cockpit and decks. The beautiful gourmet upper level galley shares its large panoramic-view windows with the saloon and bar that form an exceptional airy and bright integrated entertainment area, where you, your family and friends will enjoy the vacation of a life time. And when it comes to having fun in the water, the large teak aft deck, and the two sugar scoop swim platforms with large s/s ladders and handrails make it extremely easy and safe for everyone to get in and out of the water and take part in all the fun. It also makes getting in and out of the dinghy a breeze. No stress, no worries, all fun and enjoyment. You will swim in crystalline turquoise waters. You will snorkel into ancient caves and sunken pirate ships. You will sail to a different paradisiacal island every day. You will catch your trophy fish. You will take in the tropical sun through every pore of your body. You will enjoy delicious tropical drinks and gourmet meals. You will feel the warm and gentle trade winds combing through your hair. You will walk carelessly on miles of the most beautiful white sandy beaches. You will sleep under the stars. You will share and bond with family and friends like never before. You will sing, you will dance, you will laugh and you will play. But above all you will have the time of your life. On Sea Chateau it's all about you and your enjoyment.